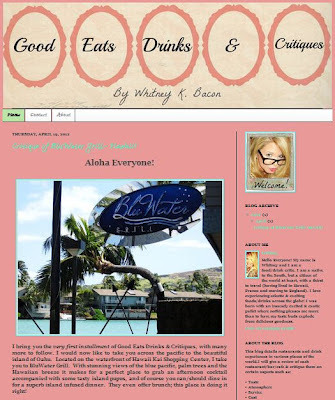 We are very excited to inform you that Whitney has launched her very own blog entitled 'Good Eat, Drinks & Critiques'. As a result of her great love of food and great eye to detail she has set about critiquing the places she eats and drinks across the globe. "I was born with an insanely excited & exotic pallet where nothing pleases me more than to have my taste buds explode from delicious goodness." Please hop on over, follow and share it amongst your peeps!